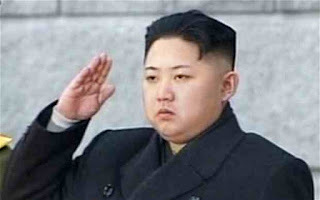 North Korean dictator Kim Jong Un's regime is busy rattling its sabers again. On Tuesday, Pyongyang warned of a nuclear attack on the Unites States at any sign of a U.S. preemptive strike as U.S. Navy strike group led by a nuclear-powered aircraft steamed towards the Western Pacific. The Unites States Navy strike group was diverted from planned port calls to Australia and would move towards the western Pacific Ocean near the Korean peninsula as a show of force. US officials said it would still take the strike group more than a week to arrive near the Korean peninsula. Tension has escalated sharply on the Korean Peninsula with talks of military action by the United States gaining traction following its strikes last week against Syria and amid concerns the reclusive North may soon conduct a sixth nuclear test. North Korean is emerging as one of the most pressing foreign policy facing Trump's administration. It has conducted five nuclear tests and is working to develop nuclear -tipped missile that can reach the Unites States. Trump's administration is reviewing its policy towards North Korea and has said all options are on the table, including military. Since last year, the number of bellicose threats coming out of North Korea has increased dramatically, with repeated claims the country might conduct preemptive nuclear strikes against United States targets and invade South Korea. The US has responded by positioning warships, including the USS McCain, an Aegis-class guided-missile destroyer used for ballistic missile defense, and a giant sea-based radar platform around the Korean Peninsula region. Military aircraft have also been sent to the peninsula. Still, it is not believed that there is much behind the threats other than talk, particularly given the expert assessment that Pyongyang doesn't have nuclear weapons capable of reaching the US. Although the US appears to be taking the new rhetoric seriously, concerns do not appear to be great in Washington or elsewhere in the West that North Korea is any closer to waging any kind of real war. "Despite the harsh rhetoric we're hearing from Pyongyang, we are not seeing changes to the North Korean military posture, such as large-scale mobilizations and positioning of forces," White House said. The new tensions between the U.S. and North Korea, come just weeks after Pyongyang conducted its fifth nuclear test. Six-party disarmament talks with North Korea have been stalled since 2008 and experts believe the new rhetoric may increase pressure to restart negotiations. Fortunately, the probability of a major war remains low. One reason for optimisim is China, and another is the rationality of North Korea's leadership. Those in power in China haven't abandoned the troublemakers on their northeast border, even in the wake of past military attacks, in order to prevent the Kim regimes from collapsing. They prefer to keep the country as a buffer against the United States. In addition, they are also extremely concerned about a potential mass influx of refugees. But there's one thing China needs even less: open warfare. And this is also clear to North Korea's leaders. Even in times of peace, the regime's survival is dependent on trade, foreign aid, money and goods from China. The chances of winning a war without aid are precisely zero. In the past, North Korea's leaders have calculated very coolly and dared to venture only the things they believed China would accept. Like his father, the young Kim is well aware that the regime would not survive a real war with the United States. But this blatant threat is the product of clear calculation. It enables an otherwise weak country to appear threatening. Domestically, it will enable him to score points to mark the Americans as enemies and pit himself against the South Koreans. Abroad, this will perpetuate an image of North Korea remaining unpredictable, which will give the country greater room for maneuver in negotiations. And it is also entirely possible that it will undertake individual military strikes in the border region with South Korea like it did in 2010. But things won't go much further than that. The question remains as to what could have moved North Korea to heat up the conflict with its increasingly excessive statements. One explanation is that North Korea may wage greater provocations such as a nuclear test timed with various anniversaries, including the Supreme People's Assembly. On Tuesday, North Korea convened a Supreme People's Assembly session, one of its twice year sessions in which major appointments are announced and national policy goals are formally approved. But also Saturday is the 105th anniversary of the birth of Kim II Sung, the country founding father and grandfather of current ruler, Kin Jong Un. To this end, the war rhetoric would make a certain amount of sense.